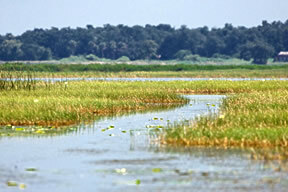 The St. Johns River’s shoreline in central Florida. 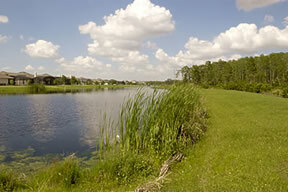 Shingle Creek Management Area nestles next to developed neighborhoods in central Florida. 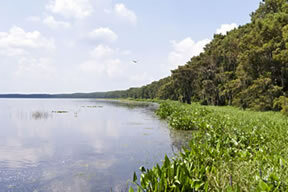 Lake Tohopekaliga in central Florida. The Environmental Measures Team performs environmental assessments of wetlands and surface waters and other related work, in support of determining sustainable groundwater withdrawals in central Florida. The team will work to develop options for a consistent definition of harm to be used by the St. Johns River, South Florida and Southwest Florida water management districts for environmental review in water supply planning and water use permitting. The three water management districts previously conducted field assessments of approximately 400 wetlands and lakes within the CFWI project area, as part of the Central Florida Coordination Area effort. Another 45 wetland assessment sites with water level monitoring data have been examined for quantitative relationships between hydrology and the observance of stress indicators. These sites will be used to quantify the link between ecological condition and the historic water regime. Statistical analysis of hydrologic data to identify metrics that may be suitable for differentiating between hydrologically stressed and unstressed wetlands. Cluster analysis of study site data to discern how wetlands may be best categorized into groups (mostly unstressed, mixed stressed and unstressed and mostly stressed). Generalized risk for harm modeling based on level of drawdown. Fitting probability distributions to the wetland hydrology data to determine the likelihood that a site will be categorized as stressed or unstressed as a function of hydrologic alteration. This approach allows for the extrapolation from sites with water level records to the much larger number of CFWI sites for which there are no hydrologic monitoring data.